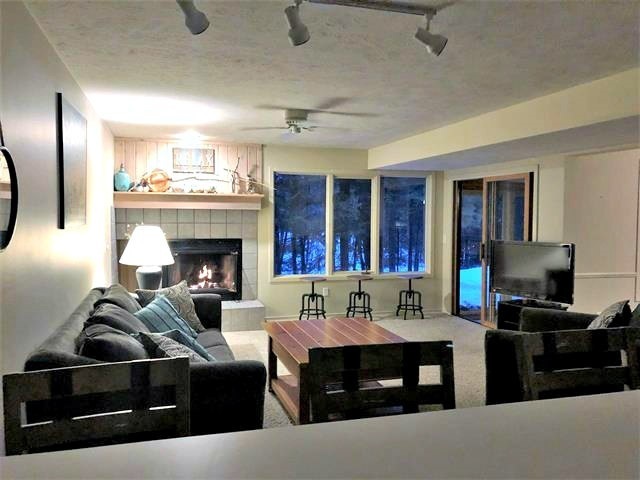 Charming Trout Creek condo - rare, larger, single-level floor plan. This spacious unit has a private porch and patio outside - nice private space for easy outdoor living. Two large bedrooms, large master bath and 2nd bath, oversized kitchen and a "flex" room - to use as a large dining room, family room, office or a combination. Large glassed-in 8 x 24 porch (unheated) has new doors and provides plenty of extra summer living space. Patio with landscaping off the porch is delightful. Nice location away from the road, tucked in the trees, close to one of the outdoor pools. Quarterly dues of $1600 covers all Trout Creek amenities - indoor and outdoor pools, hiking trails, tennis courts, fitness center, playground and Club House, as well as water, septic, snow removal, landscaping, trash removal, all exterior building maintenance (windows, doors, roof, siding). Trout Creek has a drop-off recycling area, easy access to snowmobile trails and the North Country Trail, as well as a parking area for trailers. Winter weekends include a shuttle to Nubs Nob..